Disney and LucasFilm's Rogue One: A Star Wars Story became a box office hit in its first weekend, taking in a massive $155 million. That weekend, it only had one movie going up against it, with Warner Bros.' star-studded drama ensemble Collateral Beauty. But in its second frame, it had much more competition. This year's crowded Christmas slate featured Universal's Sing, Sony's Passengers and a pair of 20th Century Fox films, Assassin's Creed and Why Him?, none of which were expected to give Rogue One a run for its money this weekend. Rogue One easily came out on top again, taking in an estimated $64.3 million for the three-day weekend, and $96 million for the four-day holiday weekend, which includes Monday estimates. Box Office Mojo reports that, over the three-day frame, Rouge One dropped 58.5% from its opening weekend, but if you use the four-day numbers of $96 million, it only dropped 38%. That latter figure is more on par with the 39.8% drop of Star Wars: The Force Awakens last year, when Christmas Day fell on a Friday, instead of Sunday this year. 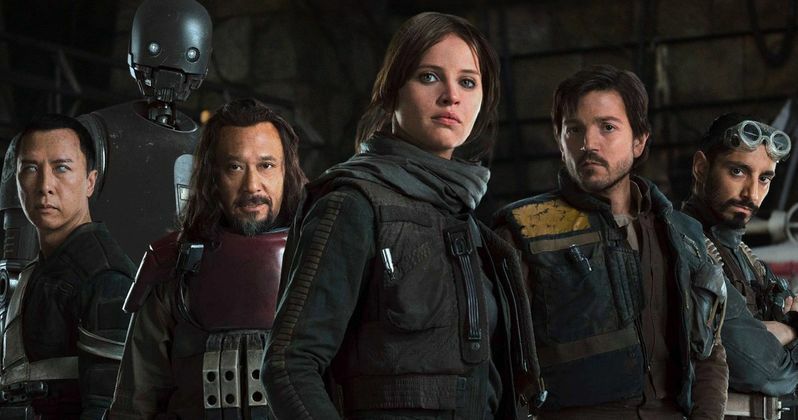 This weekend's tally has put Rogue One over the $300 million domestic milestone, with its current take at $318 million, which is the ninth best tally this year, although it will likely pass a number of films in the weeks ahead, such as Suicide Squad ($325.1 million), Batman v Superman: Dawn of Justice ($330.1 million) and Zootopia ($341.2 million). It still has some work to do to get into the top 5 for the year, though, which is comprised of Deadpool ($363 million), The Jungle Book ($364 million), The Secret Life of Pets ($368.4 million), Captain America: Civil War ($408.8 million) and Finding Dory ($486.2 million). Despite four newcomers challenging Rogue One: A Star Wars Story, none managed to come close, with the new releases rounding out the top 5 behind this Star Wars adventure. The animated musical Sing debuted in second place with $35.2 million ($56 million four-day gross), followed by Passengers in third place with $14.8 million ($23.8 million four-day gross), Why Him? in fourth place with $11 million ($16.7 million) and Assassin's Creed in fifth place with $10.2 million ($15 million four-day gross). Aside from Sing (72% on Rotten Tomatoes), none of the other newcomers were too beloved by critics, with Passengers scoring a 32% RT rating, with Why Him? earning a 41% RT rating while Assassin's Creed earned just a 19% RT score. Sing debuted in 4,022 theaters for an impressive $13,943 per-screen average, with a $76.6 million domestic total since debuting on Wednesday, December 21. Passengers debuted in 3,478 for a decent $6,642 per-screen average, for a domestic total of $30.4 million since its Wednesday debut. Why Him? earned $5,730 from 2,917 theaters for a six-day domestic total of $16.7 million, while Assassin's Creed earned a $5,051 per-screen average from 2,970 theaters, for a domestic total of $22.4 million. Sing is set in a world like ours but entirely inhabited by animals, centering on Buster Moon (Academy Award winner Matthew McConaughey), a dapper Koala who presides over a once-grand theater that has fallen on hard times. Buster is an eternal optimist-okay, maybe a bit of a scoundrel-who loves his theater above all and will do anything to preserve it. Now facing the crumbling of his life's ambition, he has one final chance to restore his fading jewel to its former glory by producing the world's greatest singing competition. Five lead contestants emerge: A mouse (Seth MacFarlane) who croons as smoothly as he cons, a timid teenage elephant (Tori Kelly) with an enormous case of stage fright, an overtaxed mother (Academy Award winner Reese Witherspoon) run ragged tending a litter of 25 piglets, a young gangster gorilla (Taron Egerton) looking to break free of his family's felonies, and a punk-rock porcupine (Scarlett Johansson) struggling to shed her arrogant boyfriend and go solo. Each animal arrives under Buster's marquee believing that this is their shot to change the course of their life. The release of Passengers marks the end of this story's journey that spans nearly a decade, after writer Jon Spaihts' script landed on the coveted Black List back in 2007. Keanu Reeves and Reese Witherspoon were once attached to star, long before Chris Pratt and Jennifer Lawrence landed the roles of Jim Preston and Aurora Lane. On a routine journey through space to a new home, two Passengers, sleeping in suspended animation, are awakened 90 years too early when their ship malfunctions. As Jim (Chris Pratt) and Aurora (Jennifer Lawrence) face living the rest of their lives on board, with every luxury they could ever ask for, they begin to fall for each other, unable to deny their intense attraction... until they discover the ship is in grave danger. With the lives of 5000 sleeping passengers at stake, only Jim and Aurora can save them all. The supporting cast includes Michael Sheen, Laurence Fishburne and Andy Garcia. The top 10 is rounded out by Moana ($7.4 million, $10.4 million four-day), Fences $6.6 million, $11.3 million four-day), La La Land ($5.7 million, $9.7 million four-day), Office Christmas Party ($5.1 million, $7.2 million four-day) and Collateral Beauty ($4.2 million, $7 million four-day). Fences expanded from six theaters last weekend, where earned an impressive $129,462 from four theaters for a $32,366 per-screen average, to 2,233 theaters this weekend, where it earned a $2,995 per-screen average. The film currently sits at $11.5 million domestically, just under half of its $24 million budget. La La Land expanded into 534 more theaters for a total of 734 theaters, with a decent $7,806 per-screen average. There were also a number of highly-anticipated films opening in limited release this weekend, many of which fared quite well. Paramount's Silence had the best limited release weekend of all, earning $131,000 from four theaters for a whopping $32,750 per-screen average. 20th Century Fox's Hidden Figures took in $515,499 from 25 theaters for a $20,620 per-screen average, with Lionsgate's Patriot's Day earning an impressive $161,306 from seven theaters for a $23,044 per-screen average. Focus Features' A Monster Calls earned $30,910 from four theaters for a $7,728 per-screen average, with Warner Bros.' Live By Night earning $33,000 from four theaters for a $8,250 per-screen average. No box office figures were given for IFC's The Autopsy of Jane Doe, A24's 20th Century Women or Sony Pictures Classics' Toni Erdmann.